Address: Buganvillas, 4, Playa Blanca (Lanzarote), Islas Canarias. Located in Los Colorados, just a few minutes' walk from Lanzarote's Papagayo Beach, these smart bungalows have a communal pool with hot tub. 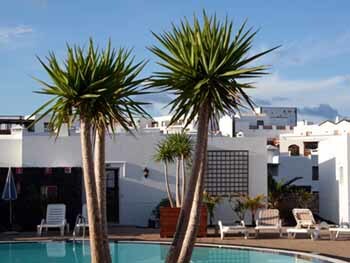 Make the most of Lanzarote's fabulous weather when staying at the Coloradamar Bungalows. Take the short walk down to the local beach for a swim in the Atlantic Ocean and admire fabulous views towards Fuerteventura. The bungalows are located in Playa Blanca, a charming seaside town with local shops, bars and restaurants to browse. Each air-conditioned Coloradamar Bungalow features 2 bedrooms and 2 bathrooms. There is also a lounge area, fully-equipped kitchen and furnished patio. Other on-site facilities include a tennis court, available at an extra cost. Bungalows with sea views are available for a supplement. Please inform Bungalows Coloradamar in advance of your expected arrival time. You can use the Special Requests box when booking, or contact the property directly with the contact details provided in your confirmation. Please note children over 12 years old are considered as adults.